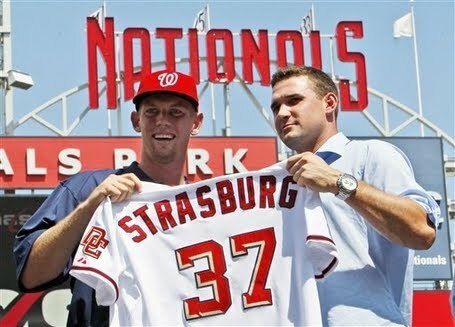 Blog favorite, Joe Posnanski, is doing a live blog for Stephen Strasburg's debut. We were thinking of doing the same but are more than happy to sit back, relax, and enjoy Poz's thoughts on the inning-by-inning action. The game is on MLBtv right now, and here is the link to Joe's live blog. I think you'll have to hit "refresh" every once in a while to get the updates. If you're watching and/or reading, enjoy the action!